The seventh edition of our famous opening event "CALL THE SHIP TO PORT" sets off on 19. July 2019. Aboard Europe's biggest domestic eventship, the MS RheinEnergie, we invite you again to start the Amphi-weekend with an enchanting evening cruise along the Rhine. No matter if you choose to enjoy the relaxed atmosphere at the promenade deck with cocktails, snacks and various other refreshments or to rock out to the concerts at the fully air-conditioned main hall, CALL THE SHIP TO PORT remains the ultimate overture to the Amphi Festival weekend. Speaking of the bands, we once again focused strongly on presenting you a well-paired selection, to make you bust a move instantly! As headliners expect nobody less than the British synthpop-veterans MESH. Also look forward to masterclass electropop with SOLAR FAKE as well as the ever impressive DIORAMA, whose songs unleash an electrifying energy on stage. S TRICTLY LIMITED TICKETS NOW AVAILABLE AT AMPHI SHOP! Strictly limited to only 1333 pieces, the highly coveted CALL THE SHIP TO PORT 2019 tickets are now exclusively selling at the Amphi Shop at www.amphi-shop.de. 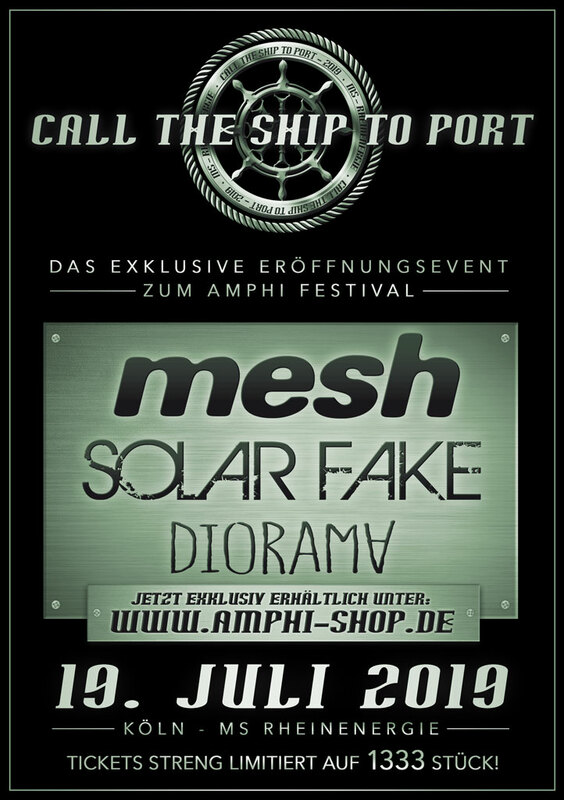 As always the CALL THE SHIP-TICKETS are delivered together with an Amphi Festival 2019 weekend-ticket! 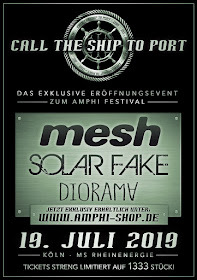 In case you already bought an Amphi Festival 2019 weekend-ticket earlier, we then give you the alternative to buy the CALL THE SHIP-UPGRADE. The upgrade provides only admission to CALL THE SHIP TO PORT and not the Amphi Fest itself. A small hint: the shop also allows to combine the CALL THE SHIP-UPGRADES with Amphi/E-Tropolis 2019 combi-tickets! In any case we recommend to get your tickets soon. Last time CALL THE SHIP TO PORT was booked out after just a few weeks.